You can press, push and flye for heftier pecs but you don’t have to spend lots of time doing it. Try this twice-weekly approach for deeper, more detailed pecs. 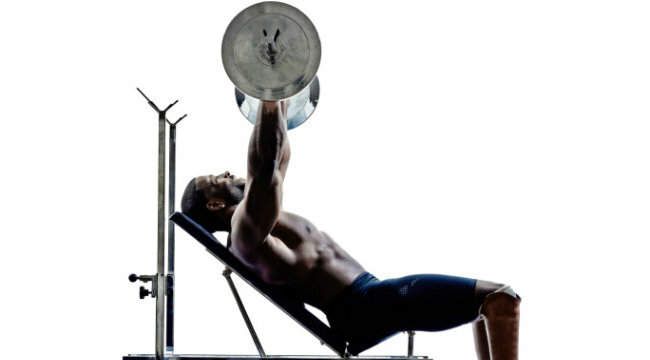 If you are the guy who always starts off his chest workout with flat bench presses, we have a few things to say. First of all, your insistence on doing so is the reason no flat benches are available in any gym on Mondays. Secondly, blind allegiance to flat presses is the reason why our generation is upper pec deficient. That’s right – Golden Era guys like Schwarzenegger, Columbu and Zane would shake their heads in shame at our collective lack of upper pec development. The truth, gentlemen, is that you can’t build a chest worth showing off unless it is trained to its fullest through every angle imaginable. This twice-weekly workout plan is built on that simple premise; instead of starting your week with the flat bench, per the usual, you’re going to head straight for the incline. With your pre-workout raging through your veins, you’ll soon be pressing gnarly weight loads toward the ceiling, touching off crazy new growth in your under-trained upper chest. From there, things normalize with flat-bench dumbbell presses and pushups, with some calculated twists to jack up the intensity, of course. Your second workout goes back to the traditional “flat bench first” routine but at a higher rep range and with the flye coming immediately after to isolate your chest. Peep these “quickie” workouts and see if you can put them to work for you. We’ll go ahead and thank you in advance for alleviating some of the Monday traffic on flat bench row. If you want to build thickness and mass in the chest area, you need to start with incline presses. Like most dudes, I love the flat bench press but nothing beats the incline barbell press for dynamic, eye-popping chest development. It builds your chest muscle from the clavicle to sternum and helps to negate that sagging chest look, cultivated from years of your “flat-bench fo’ life” philosophy. This is the heavier of the two workouts during the week and you’ll be sticking with presses and pushups. This allows you to work more muscle at once. We will save the flyes for the higher rep day. Directions: Perform all three exercises in a circuit fashion. After one warm-up set using light weight (except the pushups), use a weight that is about 80-85% of your one-rep max (1RM). Rest 90 seconds between circuits. Make sure to rest at least 48-72 hours before you perform the next shoulder and/or chest workout. 1 Take a full 8 seconds on the eccentric portion of each rep. If the reps are too easy, add weight via a vest or by having a partner place weight plates on your back. Most people utilize the flat bench press for heavy weight and low reps. (How much do you bench, bro?) But many bodybuilders build huge chests with high reps on the flat bench. Who’d have thunk it? We then move on to the incline flye to put some isolation work into our newly-highlighted upper-chest. Finish off with some pushups and your chest is finished for the week. Directions: These exercises are performed in straight sets fashion. Finish all sets and reps for one exercise before moving to the next. For each exercise except the pushups, perform one light warm-up set and then start at a weight that is about 65% of your 1RM. Add weight on each set until you reach about 80% of your 1RM. Make sure to rest at least 48-72 hours before you perform your next chest workout.